The Woodlawn Cycle Cafe has opened in downtown Woodlawn on First Avenue South between 55th Place North and 56th Street South (north and south streets converge right at this point). If a cool coffee shop filled with hipsters is a sure sign that a working-class neighborhood with low-priced housing stock, little retail, and large pockets of poverty is turning a certain psychological corner–here’s the evidence (interior, above). The exterior (above) is simple but well-detailed, with custom steel doors and windows that complement the Stockholm-meets-Birmingham interior. Open for only a few weeks now, it’s a jaw-dropping surprise to anyone who’s witnessed the struggles of this neighborhood over the last many decades. However, when one understands the tireless efforts of many organizations, from REV Birmingham to the Woodlawn Foundation in making improvements over the years, perhaps this coffee shop is indeed the next logical step in the rebirth of a very historic part of Birmingham. The coffee is from Madcap; the delicious lunch we sampled included braised oxtail empanadas and a paté melt. Armand Margjeka and Kyle Campbell are the partners behind this new business. Directly across the street is Margjeka’s concept store Open Shop (above), whose design sense and product stock is again a bit jaw-dropping for those unfamiliar with Woodlawn’s current resurgence. After an expresso across the street, it’s worth a visit. And then stroll back down to First Avenue North and dream about what project may emerge next. Congrats to all of those who had a vision for change in Woodlawn; we can’t wait to see more. Walk, drive, or cycle to the new café as quickly as you can! 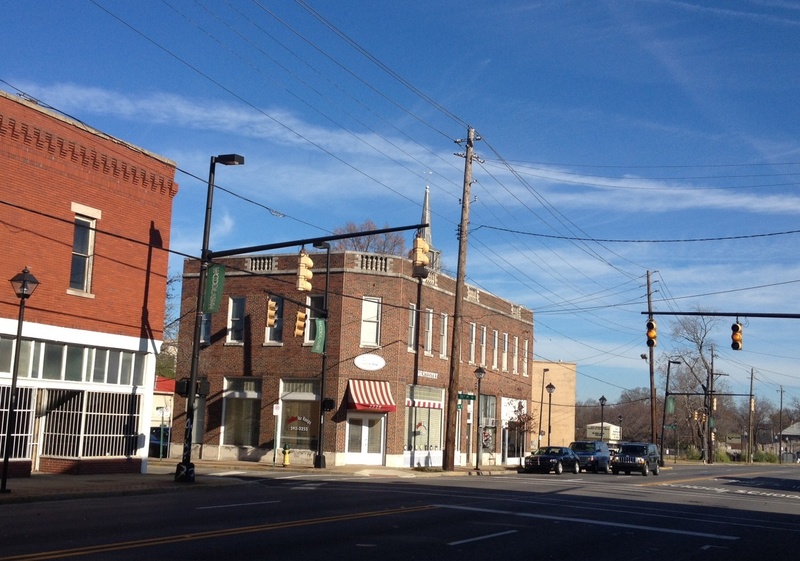 Central Woodlawn — a few minutes’ drive (or future tram ride!) 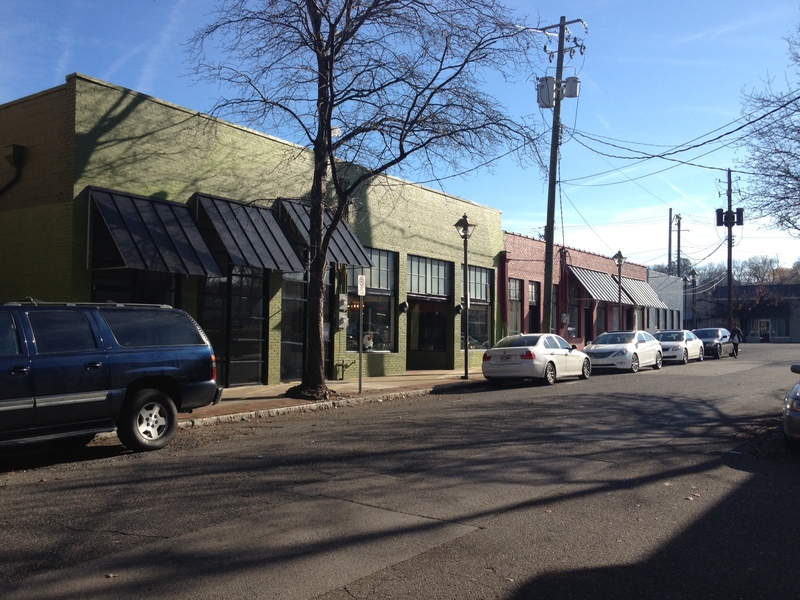 east of downtown Birmingham — is a superb example of urban place: well-scaled commercial storefronts, memorable historic architecture, a mixture of wider and narrower streets, and short blocks. This once-busy retail and business center has lost tenants and foot traffic over the years, but the fabric largely remains. 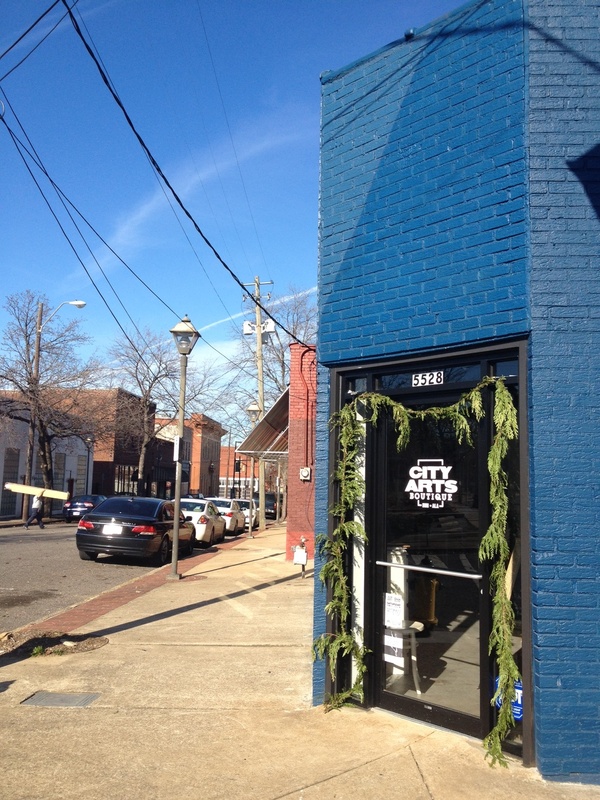 Main Street Birmingham, a non-profit dedicated to revitalizing neighborhoods, has recently renovated a row of one-story storefronts into 55th Place Arts, with low rents targeted to artists (above, on 55th Place North). This city has been too slow to recognize the key role artists can play in urban revitalization; the Phoenix Building downtown (which we developed and designed), with its 74 live-work units of which 60 are subsidized and targeted to artists, is perhaps the only other comparable project in town. The corner of the project at 55th Place and First Avenue South is seen above, with the entrance to the new City Arts Boutique. Note the fine texture of the buildings along 55th Place, and the easy pedestrian scale of the environment. 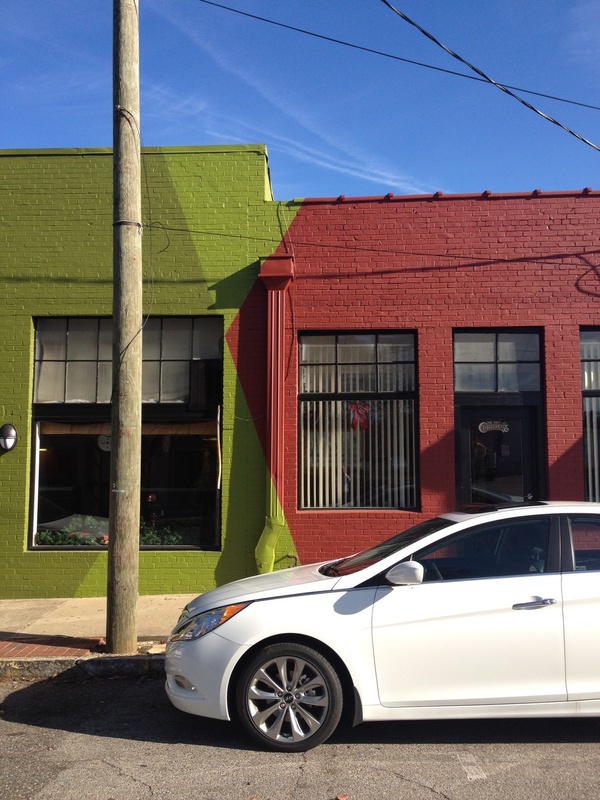 Besides reactivating the street with new businesses and artistic energy, we really appreciate the paint job on the facade, illustrated above. Rather than the standard, conservative browns and grays painted evenly across a surface that you tend to see around town, playful angles and varied tones suit the reconstitution of these storefronts into artist workspace. Kudos to Main Street (and to the Design Review Committee, which today approved new signage and door treatments for the project) for allowing color to be used creatively here. It looks super. Just down the street (at First Avenue South and 55th Street North), Smiles for Keeps–a dental clinic for children and teens–is building a new facility on a prominent corner site, currently asphalt parking. 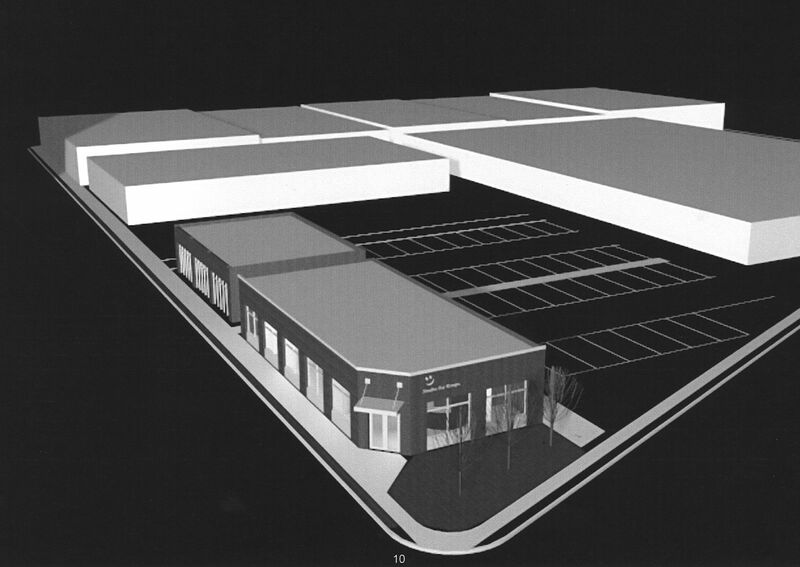 Above is a rendering (architect: John Holmes), showing the new building with a landscaped area at the corner, and a proposed future building just beyond. A good deal of parking will remain at the rear. Clearly, reclaiming any piece of asphalt parking for a new building is a good thing; on a corner it’s even better. It’s good these buildings have relatively generous storefronts to allow transparency, and that they come to the sidewalk line along 55th Street. What’s less satisfactory is the resolution of the corner itself; while the intent was to mimic the corner entrance at the building currently leased by the clinic around the corner, in this case the “corner entrance” isn’t actually at the corner of the lot. The left-over green space feels just that–left over–and one wishes there were some way to extend the mass of the building out to that corner. Above is the historic Woodlawn building currently occupied by the clinic, with that original corner entrance that works seamlessly with the site. Despite this gripe, overall it’s great to see what Main Street Birmingham has been able to encourage in terms of neighborhood investment and even “buzz” about the cool factor represented by the potential in this neighborhood. Working with minimal staff and very tight budgets, this non-profit is on to something here. We wish them, and Woodlawn, much success in the future. Yesterday I traveled out to Trussville Springs for the first time. This is a planned, mixed-use development about 15 miles northeast of downtown Birmingham, and was designed by the internationally recognized planning firm Duany Plater-Zyberk (DPZ). DPZ–which has also designed the Mt. Laurel and Blount Springs developments in the metro area–is known as the preeminent proponent of New Urbanism worldwide. New Urbanism draws on time-tested urban principles, and argues that communities should be compact, mixed-use, and friendly to alternative transport. It is an antidote to sprawl. Trussville Springs’ master plan is certainly typical of DPZ work: lots of preserved open space and public amenities instead of private lawns; garages fronting alleys, rather than driveways on the main streets; a commercial center designed within walking distance of all residents; and a distinctly old-fashioned marketing package that draws heavily on nostalgia for an earlier time. 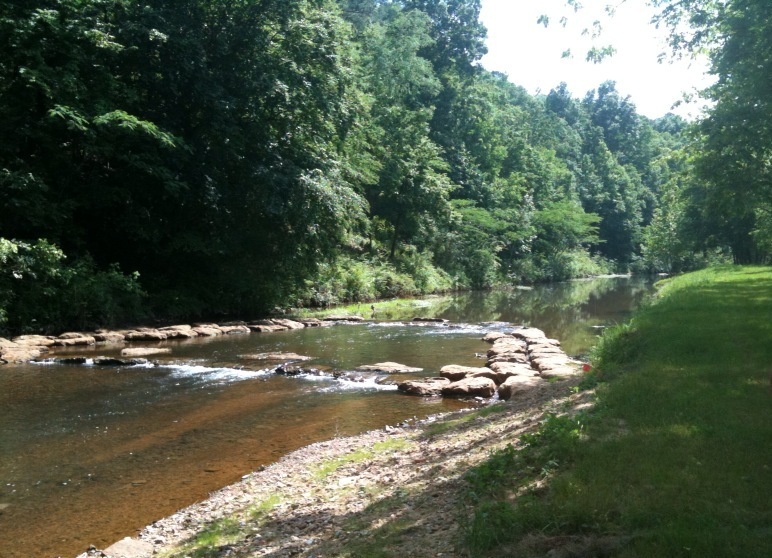 The Cahaba river runs through here, and is beautifully framed by old trees and rolling hills. Yes, the developer skillfully inserted some stones into the river to create both a “rushing river” sound, and to allow a path across. But still, it is a stunning natural feature. However, something strikes me about this–and many other new towns designed by DPZ and their many imitators. 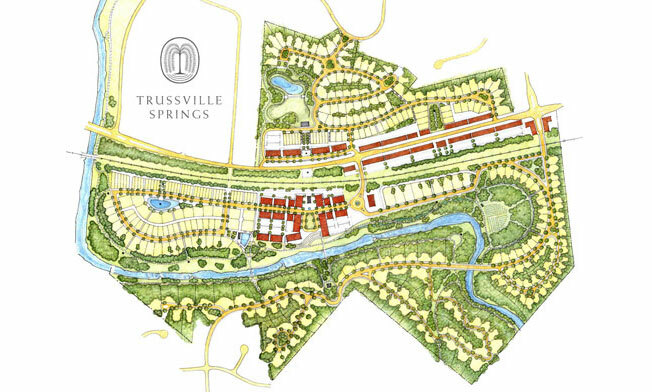 While certainly preferable in many ways to typical, sprawl development, whose gated communities and feeder roads encourage car use, social isolation, and single-use development, I can’t get over the feeling that Trussville Springs isn’t dense enough to qualify as a real antithesis to sprawl. It’s hard to say due to the current economy (only a few houses have actually been built), but with all the empty housing stock in the metro area, much of which is already in compact, urban neighborhoods, and without larger influxes of new people moving into the metro, the overall need for a place like Trussville Springs seems questionable. 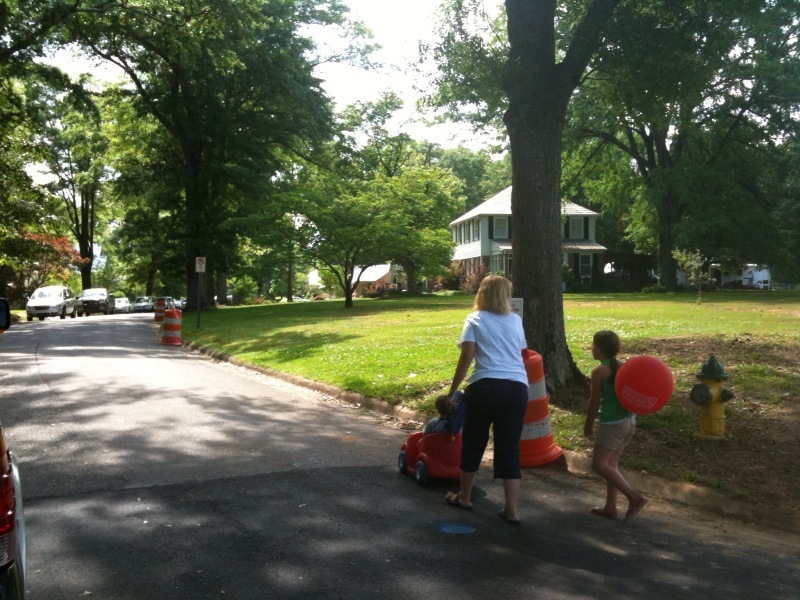 In fact, right across Main Street is downtown Trussville: a fairly compact, urban, walkable neighborhood, with big trees, narrow streets, and sidewalks filled on Saturday with families strolling to the school for a festival, to the library or just chatting with neighbors on front porches. As an authentic, organic neighborhood, that actually seems to thrive with a lot of the New Urbanist principles, it made me wish all that energy spent across the street in Trussville Springs was instead being spent elsewhere. It was sort of like an “Old” Urbanist neighborhood already existed across the road. If you talk to Andres Duany, he will tell you that the final rendition of the developments he planned is often disappointing. The original intent for affordable housing? Gone, due to market forces. Transit connections? The municipality isn’t interested. That quaint commercial center filled with corner grocers, ice-cream shops, and quirky live-work spaces for artisans? The developer just didn’t see the demand, and filled the space with more houses instead. So residents end up having to get in their cars, head onto the highway, and go the the strip malls like everyone else. Instead of truly transforming how people live and interact, these places become just prettier, slightly denser versions of homogeneous suburban developments. Here’s an idea: let’s hire DPZ (or some like-minded company) to design a master plan for an existing urban neighborhood in need of revitalizing and repopulating. We’re not creating new roads, or extending the power grid, or tearing up more virgin land on the outskirt of the urban core. It could be Woodlawn. Or Rosedale-downtown Homewood. 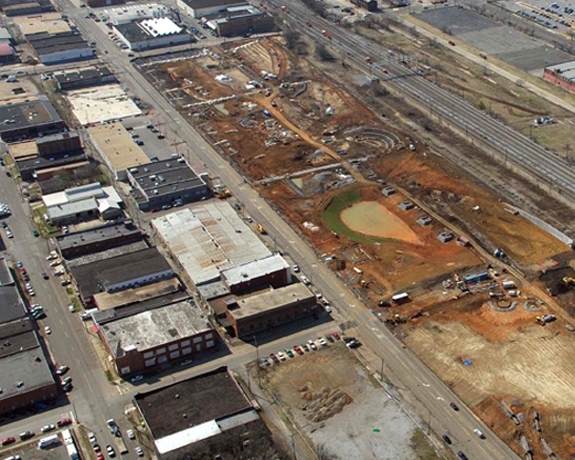 Or the Railroad Park neighborhood. Places that could benefit from more density, more alternative modes of transportation, more shops and services. DPZ did a master plan for an area of downtown Providence, RI that examined many smaller sites, suggesting new densities, retail opportunities, transit improvements, etc. To me, this type of planning is what is going to save Birmingham from soulless sprawl and urban neglect, not far-flung suburban communities like Trussville Springs, as well-intended as they may be. 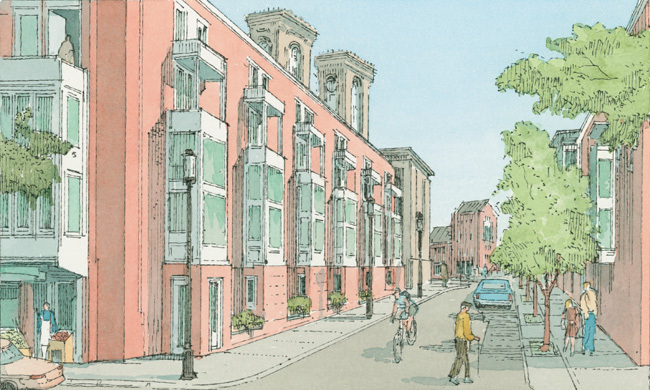 Of course, Providence didn’t just hire DPZ to make pretty renderings like the above. They have been methodically implementing the plan over the last decade. Birmingham has a terrible history, as I’ve noted before, of commissioning plans which, due to lack of community buy-in and leadership, sit gathering dust on the shelf. Wouldn’t it be great if we had excellent urban plans, prepared by experts with lots of community participation, and the will/mechanisms to actually implement? I see a city where New Urbansim and plain-old Urbanism could weave together in a brilliant web of vitality. There’s a lot more to say about this topic, coming soon.